Automatic tracking of time and productivity – no paper forms, timesheets or timers which you have to start and stop. 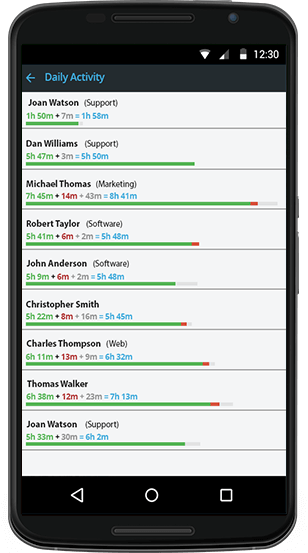 Review your scheduling and prioritizing skills, improve attendance to meet all deadlines and eliminate time wasters. Get more things done every day by using tools you really need and keep the most distracting ones away. Check attendance to make sure you can meet deadlines. Avoid overloads by staying punctual and organized. Stay up to date on the slightest changes in your productivity – Yaware.TimeTracker will send you automated notification. Clear, yet complex reports on productivity in one place to give you a full picture of a working day.